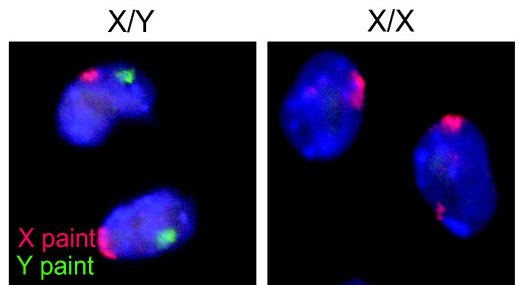 English: X-chromosomes (red) and Y-chromosomes (green) in embryonic stem cells of male (X/Y) and female (X/X) mice. This is an Open Access article distributed under the terms of the Creative Commons Attribution License (https://creativecommons.org/licenses/by/2.0). To the uploader: You must provide a link (URL) to the original file or journal article. Please put the image into the right subcategory of the Category:Media from BioMed Central.